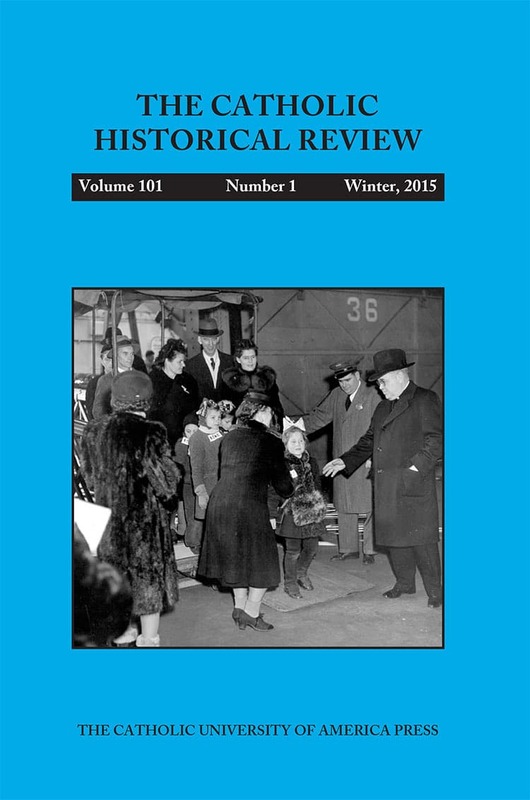 We invite you to preview highlights from Volume 101, Number 1 (Winter 2015) of the Catholic Historical Review. On this page you can browse summaries of articles appearing in the Catholic Historical Review. Members: Click here to read the full issue. The author reflects on her career working in the history of early Christianity, including discussion of her undergraduate and graduate study, teaching activities, publications, and relationships with colleagues. In this study on the role of patronage in ecclesiastical careers, the central role of Rome in the distribution of benefices in Portuguese cathedrals is highlighted. Kings, bishops, and others used canonries as payment for services rendered. Although the virtues of the applicants for canonries were important, patronage ties could override personal qualifications. There also were alternative routes to obtaining an office in a cathedral that circumvented the power of the appointment holders, which allowed some to overcome possibly weaker patronage ties. In 1837 Prussia arrested Clemens August Droste zu Vischering, archbishop of Cologne, in a dispute over mixed marriages. This event, known as the Kölner Ereignis (The Cologne Troubles), ignited protests and riots for more than a year and re-energized Catholicism in Germany. Examining the Kölner Ereignis reveals that, in contrast to Prussia, Austria was a nonconfessional state. Rooted in the Enlightenment, its church system had legitimacy and stability for its subjects. Comparing the two German powers in the Kölner Ereignis sheds light on this event and important features of these two states that tend to be overshadowed by later developments, most notably the Reichsgründung. From the mid-nineteenth to the mid-twentieth century American Catholic bishops were mainly guided by two priorities in their work on behalf of migrants arriving in the United States: providing for the pastoral and material needs of their flock and advocating for fellow Catholics. In the second half of the twentieth century the primary rationale behind the bishops’ migration-related activities began to shift. Although pastoral and institutional considerations remained important, a universal moral ethic—a “social mission”—became more pronounced as the guiding force behind the Church’s work with migrant populations. With the enactment of the Chilean Constitution of 1925 that resulted in the separation of church and state, discussions took place regarding the signing of a concordat between Chile and the Holy See. Although references to this event have been made, the existence of actual proposals was unknown. The opening to researchers of the materials in the Vatican Secret Archives pertaining to the papacy of Pius XI has led to the discovery of three documents drafted as the parties worked to reach a final concordat. The author discusses these documents. This investigation of the intersection of Specialized Catholic Action and liturgical renewal in Quebec from the 1930s to the early 1960s analyzes the theological foundations of liturgical renewal and explores the ways in which these ideas were communicated and received. What emerges is an important source for Catholic Action spirituality that complements influences such as personalist thought, yet it is too often overlooked in scholarship on Quebec. Liturgical renewal was shared with other segments of the Church in Quebec, was actively encouraged by the hierarchy, and embodied the connection between activities internal to the Church and the Church’s role in society.